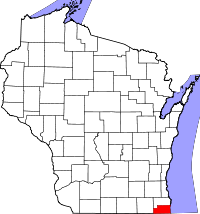 Kenosha County, in southeast Wisconsin, is part of the Chicago metropolitan area. Historical marriage records date from the time of the county founding in 1850, with birth records from 1861 and death records from 1873. Registration was erratic until mandated in 1907, with existing historical records found at the Wisconsin Historical Society, including an index. Records can be requested locally from the Kenosha Register of Deeds, with divorce records from the Clerk of Court. Uncertified copies of recent records, 1907—present, are available to the general public for $20 by mail, fax, or in-person request from the Vital Records Office of the Wisconsin Department of Health in Madison.